Located in the UNESCO World Heritage Site that is Greenwich, De Vere Davenport house sits next door to the old Royal Naval College which was designed by Christopher Wren. This grandiose building also boasts a well maintained and spacious garden area for outdoor events. This splendid red-bricked Georgian building boasts 23 indoor event spaces which are bursting with character and original features for groups of up to 120. The garden area can be used for team building activities for much larger groups and it can be arranged to have a BBQ prepared by the deVere chefs. Situated in the stunning Regent’s Park, this venue offers a superb space for outdoor events along with more intimate indoor spaces too. Sandwiched between Camden and Mayfair, this venue is ideal for those who want to do a large outdoor event without having to travel too far; there is a capacity of 1000 for outdoor events. If you require space for a formal presentation before the fun kicks-off, there is not a better space on this list than a lecture hall (auditorium if you’ve not seen one) with 370 fixed seats. If you need flexibility in the room layout, they have rooms with a capacity of up to 100. The HAC is unique the British Army in that it is incorporated and has the right to use a coat of arms. The venue is also quite unique as it is also a working Barracks. The British Army is renowned for the class of it’s establishments, here you can enjoy British Military Hospitality inside and out as this venue boasts an unusually large oasis of green space for central London (5 acres to be precise). Although located a little further out of central London than most on this list, the stunning grounds of this Italian Renaissance style building are perfect for an outdoor event. This is the last privately owned estate in London, and as a consequence, this means the venue has greater flexibility in ensuring that your every need is met. The Garden Room stands testament to this: it can also stay open a lot later than most other venues (up to midnight). This 650 capacity temporary structure is open May-September and is located in their gorgeous 12 acre garden. If you prefer to stay indoors, or you are booking during winter, they have a splendid selection of indoor space to choose between. Best known for the animals that call it home, it may surprise you learn to that London Zoo is also available for venue hire. 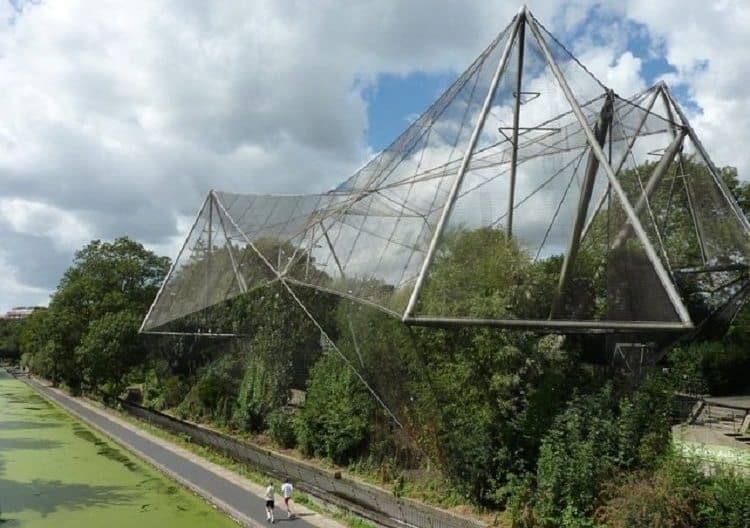 The Zoo boasts Grade II listed structures amongst its beautiful sculpted gardens. There are 3 event spaces to choose between and every one of your guests will receive complimentary entrance to the zoo. This venue would certainly make your event memorable and any strolls taken during the breaks in proceedings could prove to be as stimulating as the event itself. Adjoining the Cheesegrater, this city venue includes multiple luxurious spaces to choose between and is deceptively large. As well as it’s grand bar and gallery areas, it also boasts two very fine subterranean levels. The lowermost level has a capacity of 370 and is an ideal settling for one of our cocktail making events. Between this and the main bar is an original bank vault which is available for drinks receptions and dining. This vault has been used in numerous commercials and music videos and was recently used as a set in Spectre. This modern bar, offers fine food and excellent cocktails. There is a cosy board room which is suited for smaller groups with a maximum of 20. The Heeltap is located a stone’s throw from Borough Market and is an ideal place for smaller events. It shares a courtyard with the historic George’s Inn, the only original galleried inn left in London. The Clubhouse venues are some of the more exclusive venues that we work with. Their locations, in the centre of their respective clients’ professions, attract a well-heeled crowd indeed. Team Tactics is proud to work with such a respectable series of venues. Not only does The Clubhouse offer opulent indoor spaces and a terrace is available at their Bank location if you feel like getting some fresh air. If your event is about fine dining and even finer wine, you would struggle to do better than a Davy’s establishment, they are a wine merchant after all. They have a wonderful BBQ-inspired venue and a specially selected collection of wines to compliment it all. The Factory house is located directly opposite the Lloyds Building and offers the perfect blend of modernity and Victorian charm. This central venue boasts small conference rooms that are in keeping with the salubrious history of this surprising venue. This building used to be home to the Bank of England until 1975 and it’s vaults contained some of the Crown Jewels during The Great War. It also has a bit of a darker history as it was in the tunnels below this building that Sweeny Todd and Mrs Lovett prepared their pies. You could easily walk past this building and not notice it, but the interior, especially the back-bar, has to be seen to be believed. It’s central location is also a great help. Anyone familiar with Covent Garden will have seen The Crusting Pipe, it is their tables that stretch out into the central plaza and it is their diners that are being serenaded by the various operatic buskers that turn up. However, it is not immediately obvious just how far this pub goes back. Walk past the bar area and you will discover a series of vaulted dining areas which are ideal for smaller events such as ice carving. The food is excellent and the staff friendly, and this venue is a stone’s throw from Charing Cross. It has a sci-fi name and is in a structure that looks like it comes straight off the silver-screen. The Giant Robot offers a surprisingly informal space in a notoriously formal district of the capital. Not only are there a multitude of flexible spaces for groups of all sizes, but the whole venue is spread over two levels which helps split things up if your event requires multiple disparate areas. There is also an excellent spread of street food vendors on site who offer a variety of choices. Home to 3 livery companies, the Glazier’s Hall offers an interesting mix of tradition and modernity. The original Glazier’s Hall was destroyed by the Fire of London and it would take another 300 years before they would get a new home; The Worshipful Company of Glaziers shares this building with The Worshipful Company of Scientific Instrument Makers and The Worshipful Company of Launderers. This venue offers fantastic views of the Thames, large spaces to work with, a variety of interesting breakout spaces, and is incredibly simple to get to. The restaurant, Sushi Samba, is best known for it’s unique blend of Peruvian, Brazilian & Japanese food. 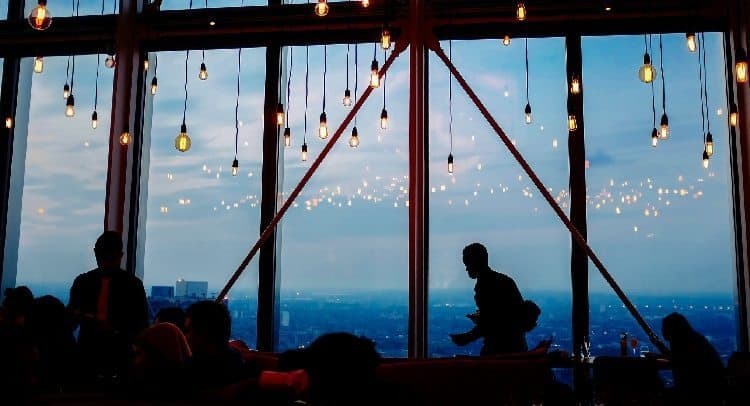 Anyone who has been to their site on Bishopsgate will know of the fabulous views afforded by it’s location on the 38th and 39th floors of the Heron Tower. It is available for venue hire, and what a space! It boasts an extremely high glass ceiling and the highest outdoor terrace in Britain, this certainly is a room with a view. If you have the budget, few other venues carry the same ‘wow’ factor. Although there is no illusion to prohibition America, this venue conjures up the covert nature of that era. It is accessed via a doorway in the arched walkway under Charing Cross station; from there you descend steps which double back on themselves. Once you reach the bottom – surprise! This incredibly well-presented venue is essentially a series of private dining areas which lead of the main bar. If you are short on time, the friendly staff will more than happily have and pre-orders ready for your arrival. This charming venue, with excellent transport links, is suited for smaller groups. Tower Bridge is perhaps the most iconic bridge in the world, you may have even walked across the glass-bottomed walkway of this iconic bridge, but have you ever considered dining there? If you don’t fancy heights, there is the alternative of the engine room where you and your guests can marvel at the Victorian coal-fired engines that used to power bridge lifts. If neither of these take your fancy, you could always have one of the famous towers. Whatever your event, there are few London landmarks that share this level of fame. This venue is suitable for much larger groups, although a smaller group may make use of the gallery. The Old Billingsgate Market boasts glorious views of the Thames from their riverside terrace which is available if you hire their spectacular grand hall. If your budget only extends as far as the vaults, then you will not be disappointed, they are a marvel of Victorian brickwork and aesthetically pleasing lighting – courtesy of the in-house AV team who ensure that every technical requirement is met. The size of your event will dictate which space you wish to use here, but the entire venue is available for hire and this could quite literally make your event the bomb: there is a replica nuke and also examples of the infamous Vergeltungswaffen Weapons (if you don’t know what I’m on about – you go to the museum, now). The building itself is a lovely example of Georgian architecture and there are plenty of smaller spaces here which incorporate original features. This is a perfect venue in which to wow your guests and enjoy Britain’s military history at the same time. ‘Well, it’s not the Ritz is it?’ is a stock catchphrase of those a little disappointed with whatever they’re moaning about. Well, this venue IS the Ritz! The largest single room available for hire has a capacity of 100, however (and depending on your type of event), you could have a round-robin type of arrangement. Opened in 1906, the Ritz gained it’s Royal Warrant in 2002 and is so far the only hotel to be honoured with this prestigious award. Smaller groups would probably get the best of this venue that is synonymous with luxury, fine dining, and great service. An ex-prison may not be the first port of call when booking a venue for your event, but this former prison (and palace) has done much to redeem it’s grizzly history over the last few years; not least of all by housing the crown jewels. 1000 years is a long time by any measure, and this venue is oozing with history. Whether you interest lies in the Crays, jewels, or bears, then there is something here for everyone. There are various spaces available for events, including the moat, or you could rent the entire venue for a truly regal event! Although installed as temporary amusement, the London Eye has become a permanent fixture of the London Skyline. This venue offers a stunning backdrop for your event – London itself! The venue also offers flexibility in that they are happy to open out of regular operating hours by special arrangement. The capacity of 800 is more of a technicality, each of the 32 pods (one for each London borough) can hold 25 – it wouldn’t be suited for a conference, but it would make a nice treat. Private dining experiences are also available. This beautiful timber-framed building is located in the dead centre of St. Katherine’s Dock and never fails to impress. The Dicken’s Inn is best known for its good food and welcoming atmosphere and most people regard it simply as an excellent pub. However, they do have an events space and this is one of the better-kept secrets of the area. The fantastic location in the picturesque docks is a welcome reprieve from the hustle and bustle of Tower Hill which is only a few hundred feet away. One of the better kept secrets of the King’s Cross area: the canal museum can add a historical element to your event. Before we could make ice, we had to import it and store it. This building was constructed in the early 1860s to house ice that had been imported from Norway. This is also one of the few spaces outside of our corporate kitchens that will let you cook indoors. If you want to book our Paella event, and the weather is horrible, or you simply have a very large group you would like to do corporate cooking together – this is the perfect venue. Opened in 1828, this prestigious restaurant achieved dual fame in the 1850s for it’s food and for the chess that was played there. When the Savoy bought it out at the turn of the century they did away with the chess, but not the food and this is one of London’s oldest English restaurants. Over the years this venue has played host to the great and the good, P.G. Woodhouse was one of the regulars and referred to it as “a restful temple of food”. Even their signature cocktails pay homage to their famous customers of days gone by: ‘O.M.G. !’ being a particular favourite and named after the ubiquitous 100-year-old expression. Our country only has four 3-star restaurants, one of them is here. Since 1931 this hotel has been a favoured haunt of the rich and the famous, perhaps most famously Elizbeth Taylor and Richard Burton. During the war the hotel remained popular due to it’s robust design. In spite of it’s many refits, most of the 1930s fixtures have been retained and its ambience has been preserved. Located next to the tranquillity of Hyde Park, it is within striking distance of the rest of London and is a fantastic venue for an event. This is the mother of most modern parliaments and the seat of our democracy. Due to the sensitive nature of the building and its contents, it may be a surprise that this is also available for Venue Hire. This is because Parliament is running a programme to increase public engagement and, as a consequence, rooms previously considered to be in the inner sanctum are now available to hire. The dining rooms look resplendent with their high painted ceilings, huge windows, and carved oak panelling. These spaces will give your events to have a sense of grandeur with a dash of political intrigue. Those with a history book may be pondering over name, these were indeed the Cabinet War Rooms. They shared a site with the Churchill Museum and the name was contracted in 2010 to give the current name of this venue. The Cabinet War rooms became operational (27th Aug 1939) less than a week before Chamberlain’s ultimatum and were in use until the abatement of the German V-Weapons (28th March 1945). This space was designed so that members of the Army, Royal Navy and Royal Air Force could communicate with each other and their civilian government masters more effectively. It was from here that the British war effort was conducted and, arguably, won. 4 days before D-Day, Winston Churchill declared his intention to observe the invasion first-hand from HMS Belfast. This was opposed by the Supreme Allied Commander, General Eisenhower and the First Sea Lord, Sir Andrew Cunningham; eventually the King had to intervene to stop him putting his life in danger. This ship was headquarters ship of Bombardment Force E and fired one of the opening salvos on D-Day and went on to fire 1,996 rounds before the fighting moved beyond the range of her guns. This is by no means the only famous theatre she was involved with during her 27 years of service. This unique venue is perfect for adding a tangible sense of history to your event. This large example of Brutalist architecture achieved Grade-II listed status in 2001 owing to the scale and ambition of project. Technically the Barbican Centre and the flats are separate, but architecturally they are considered as a whole. There are a variety of spaces available for hire in this building, from conference-sized auditoria to small rooms and even indoor gardens. If you have not been there before, even the layout of the interior walkways may prove impressive. As this is primarily an arts venue, there are plenty of mind-boggling features to bewilder and entertain your guests. This is a fantastic setting to ensure that your event will be remembered. The Swan is the catering arm of Shakespeare’s Globe and provides excellent catering and hospitality no matter the size of your event. If you have a large group, the Underglobe is perhaps the best space. This is located directly below the theatre and comes complete with a full-sized model oak tree. If you have a medium sized group, we would recommend the Balcony room with it’s lovely views. If you have a smaller sized group, then the snug bar would perfect (and perfectly named). This venue is not only a London landmark, but it is the closest we have to a faithful reconstruction of the stage of that icon in English Literature: William Shakespeare. Well done for making it to the bottom of the list, this list is by no means an exhaustive supply of our venues in London (thank God!). Why have just one venue? On our Partython event we meet you at one venue, ensure everything goes smoothly, take you to your boozy double-decker bus which has karaoke as an option (please don’t), then drive you across London to your next venue; the party never stops! Team Tactics have been delivering corporate events for over 22 years in central London. We love creating quirky and innovative events suitable for all, ranging from Treasure Hunts to Robot Wars and many more. Contact us with your brief and our event experts will be happy to help you with your next London corporate event. If you still haven’t seen something that tickles your fancy, contact us.